One of the many, many games on sale through the Because We May promotion is Spirits by Spaces of Play, and even though it's two years old, it has weathered the test of time well enough to be featured by Apple, and we figured it was worth a fresh review. 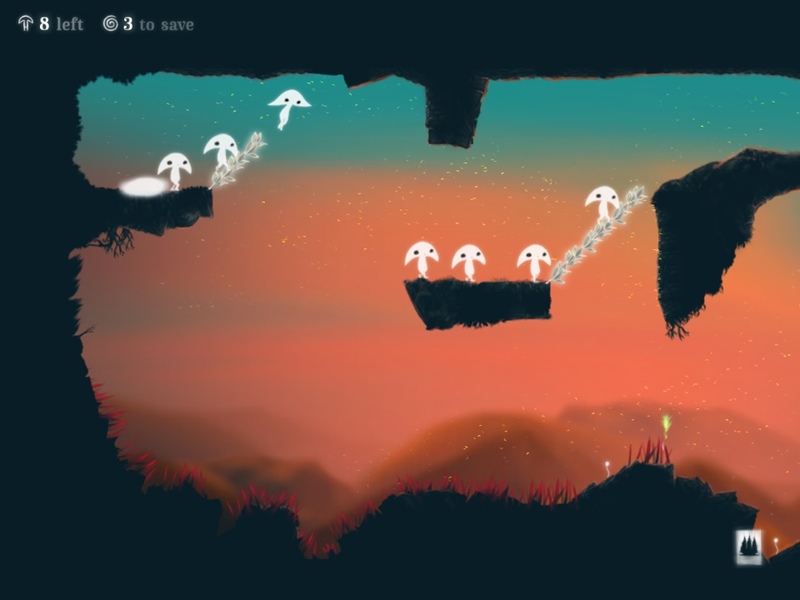 At its core, Spirits is an artsy version of Lemmings. You have to guide a mindlessly-advancing troupe of spirits to a beautiful swirling exit by transmogrifying them into different creatures which will alter the path of those following. These transformations include leaf bridges which shoot off the ground at an angle, clouds which blow your buddies across threatening chasms (or tiny black holes to block prevailing winds), and burrowing to create new paths beneath obstacles. In each stage, you'll only have access to a few of these tools, which is bound to test your patience and imagination. Every level has at least a few plant sprouts which act as bonus objectives, provided you can get one of your spirits to cross it on the ground or drop a neat little spirit bomb thingie on it while jumping overhead. 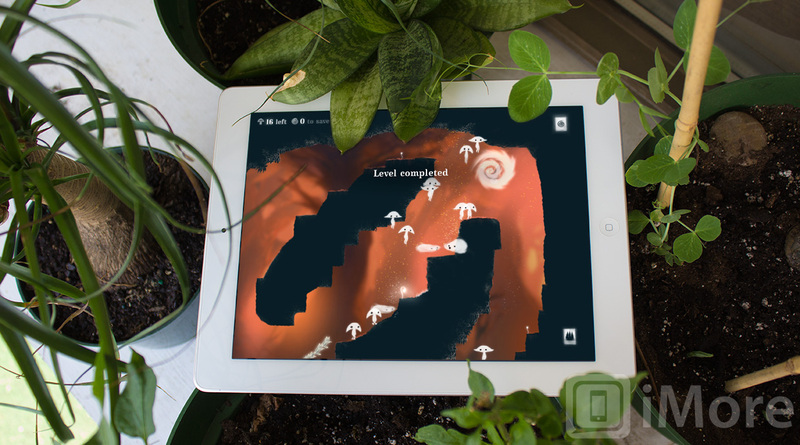 There are 43 levels total, so you'll be relying on those plants for a fair bit of the replay value. Despite being two years old, Spaces of Play has kept the graphics in Spirits fully up-to-date and optimized for the new iPad's Retina display. Wind particles are extremely fluid and impressive as they change course and merge with other wind sources. The spirits have a faint glow, and as you might expect, spirits are very light and prone to being whisked away with fluid, hypnotic animations. The background and level textures have a dark, rusty, natural feel to them, which is perfectly in line with the game's autumnal theme. The audio is equally polished. The contextual sound effects for transformations and other in-game actions blend seamlessly into the incredibly smooth and relaxing soundtrack. You can take a listen over here if you're interested. One of the bonuses of being an older game is relatively good backwards compatibility; Spirits is compatible all the way back to iOS 3.1.2, which means I could play this on my first-gen iPod touch should need arise. For ranking, there's only a bare-bones in-house system, but Game Center is there to track achievements. It would really be great to see some in-app purchases for additional levels (along with some new abilities, maybe), since the 43 that come along with the game can get chewed through relatively quickly by dedicated players. Spirits is also not universal, which means you'll have to pay separately for the iPhone and iPad titles, which also means you'll have different progress saved on either device. What I really like about Spirits is that it has managed to find a kind of timeless quality; the gameplay is good, and it's not aiming to be photorealistic, which has enabled it to age gracefully. The developer is still showing the game love, even if there are a few things like additional levels and Game Center leaderboards to add. Spirits is also versatile enough to be appealing to a wide age range - I could easily see mom, little Billy, and grandma all have a good time with this one. 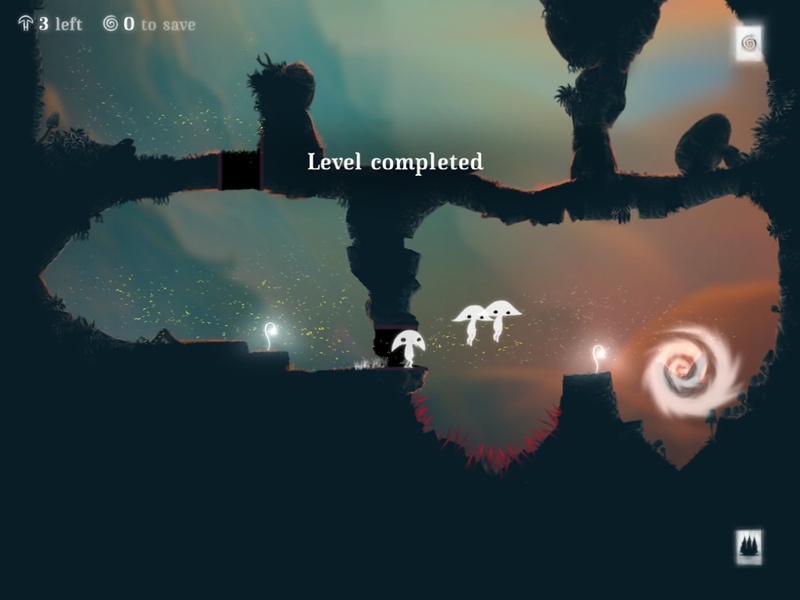 In the end, Spirits is calming, clever, and as close to interactive art as you could ask for.